Enjoyment from a no-bake fresh dessert. 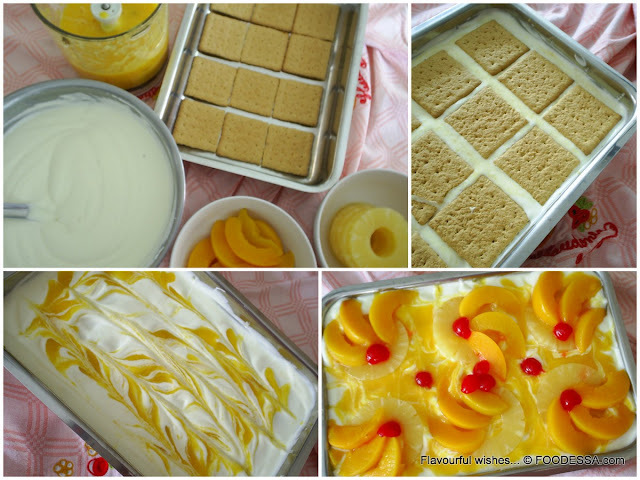 Pineapple and peaches at any time of year. COOKIE crunch into a creamy indulgence. Through the years, I've made several versions of this scrumptious light dessert. This is one of the easiest and most accessible at any time of the year. Note: for this recipe, premium, canned fruits works best. A light, un-sweetened syrup is derived naturally from the fruit. * Canned fruit to be chosen from a variety in light, unsweetened syrup only. ** Pudding mix: please consider what is being incorporated into these products...choose your brand carefully. At the very least, avoid any trans fats (hydrogenated) products. Use an 8 x 10 inch (20x30 cm) casserole dish or similar.
. In a medium (chilled) bowl and with the aid of an electric beater...whip the cream to the consistency of soft peaks. Refrigerate.
. In another medium bowl and with the same (unwashed) electric whisk...make the pudding mix with milk by following the box directions. Let the pudding refrigerate for about four minutes.
. Meanwhile, as the creams are chilling...strain the pineapple slices out of its syrup. Set aside. Also, slice the peaches and remember to reserve 18 pretty slices for the final top decoration. The remaining peaches will be puréed (or mashed) together with the reserved fruit syrup(s). This blend will be used to integrate within the layers of this dessert. Set aside.
. Afterwards, take both cream and pudding out of the fridge and proceed to gently fold the pudding into the whipped cream.
. Start the layers by placing 12 cookie wafers at the bottom of the dish.
. Slather a medium thick layer of the cream-pudding mix with the aid of a rubber spatula. Lightly pour and distribute the fruit purée. REPEAT the above layers another three times...finishing with a LAST cream-pudding layer. At the very end, lightly pour four thin rows of the remaining fruit purée along the lengthiest part of the dish. Now, run a knife lightly throughout the same rows to create a slight swerve pattern.
. As per photo...finalize by decorating with 6 full pineapple slices evenly throughout. Finally, top them with 18 slices to create flower-like fans to be topped with a split cherry center.
. Cover with a plastic wrap and refrigerate for at least six hours before serving. Overnight produces the best results. Enjoy.